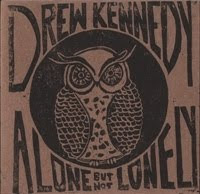 This Thursday, March 11th, Drew Kennedy will be releasing his new live album Alone, But Not Lonely. The digital release will be FREE on his website! You can also purchase a signed, individually numbered physical copy with hand-printed artwork here. I've heard the album and it's fantastic and I think you'll concur. These interviews remind me of Jiminy Glick. A great read, and the album ain't bad either. I'm sure Derek will go far. Now that is funny! Tops anything you will read from Rita. may the farce be with you...holy sh*t.